Although the screenplay is credited to writers Seth Rogen (Knocked Up) and Kristofor Brown, the story for the newest offering from producer Judd Apatow was also credited to Breakfast Club and Sixteen Candles writer/director John Hughes, who using the pseudonym of Edmond Dantes collaborated on this surprisingly cute offering from director Steven Brill. After having penned the three Mighty Ducks films before moving on to direct the uneven Adam Sandler comedies Little Nicky and Mr. Deeds, Brill does a great job of navigating Rogen and Brown’s alternately funny and heartfelt comedy about the horrors of high school that finds a trio of bullied kids looking to hire a bodyguard on the cheap to protect them from the daily beatings and humiliations they’ve come to expect in the hallways, bathrooms and grounds of their high school. Eager to make an impression, adorably scrawny and insecure Wade (Nate Hartley) who struggles against his hyper masculine stepfather and brawny stepbrothers at home, decides that he wants nothing more than to be popular and obtain a girlfriend in his high school and he begins plotting out his proactive strategy with fellow geek Ryan (Troy Gentile), an overweight student with a passion for rap who has decided that he will go by the "lady-friendly" nickname of T-Dog. Unfortunately, the two make the spontaneously disastrous decision to wear the same shirt on the first day of school and after Wade intervenes in trying to stop two horrifying bullies from shoving young, small Emmit (David Dorfman) into a locker, they’ve not only inherited a new sidekick in Broadway t-shirt wearing Emmit (fond of Cats and Rent) but also in becoming the frequent targets of the merciless duo of villains that seem to allude the awareness of the clueless school faculty including their principal (Stephen Root). When desperation leads them to outsource protection, homeless army veteran and full time schemer Drillbit Taylor (Owen Wilson) arrives on the scene first with the intention of swindling the boys to earn enough cash to go to his desired destination of Canada who begins to realize he may be actually starting to care for the three lads, not to mention their gorgeous English teacher Lisa (Leslie Mann). Although some of the dialogue and the violence near the end of the film felt a bit like overkill, I found myself surprised by the fact that I enjoyed the innocuous Taylor far more than I thought I would, despite being the first to admit that it falls into numerous films of the same underdog paradigm of most of the frat pack comedies of Will Ferrell and company over the last few years by Apatow but also the same Curly Sue, Home Alone and Ferris Bueller anti-authority works of the ever-talented Hughes as well. 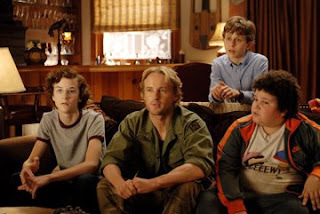 While the previews make the film appear that it’s Wilson’s show all the way and that the success of Drillbit Taylor depends solely on Wilson, similar to the way his films like You, Me and Dupree were marketed, the three young stars all manage to not only steal our hearts but also remind us of the dangers of high school and burden of bullies that overwhelmed us in our own educational career… that is, unless you were the ones doing the terrorizing.